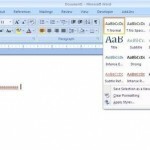 Word Formatting is a way to format your word documents. Earlier we saw how to create a Word Table in Microsoft word 2007. This article describes the various Word Styles in Microsoft Word 2007, to format the content of your Word documents. In word documents, styles are a collection of formatting characteristics like alignment, spacing, borders, font characteristics and so on.there are several methods to apply formatting on your word documents. For example, to format headings, you can select the text, apply a font say Cambria, apply bold formatting, and then apply a slightly larger font size (say 16-point) than the size that you use for the body text. When you apply formatting by directly selecting the text in the Word document, the technique is called “Direct formatting”. The same can be achieved with a single click by applying the built-in style named “Heading 1”. Each built-in style has its own pre-defined formatting characteristics and you may apply the appropriate style to text on your word document. For example, to apply the style named “Heading 1” to any Heading in your Word document, click on such Heading and select the style “Heading 1” from the styles gallery. Direct Formatting is not only a time consuming task but it is also prone to mistakes, and end result may not be satisfactory. In the example stated, you must repeat the direct formatting process for each heading and you must also make sure to select the same font size every time. If you want to have subheadings in your document, you must decide how to differentiate the subheadings from the headings (smaller size? italicize?) and repeat the direct formatting process for each subheading. If you don’t have expertise in design or typography, you may not succeed in creating a professional looking document. On the contrary, the built-in “Quick Styles” are designed to ease your formatting process as most characteristics are pre-defined. For example, the Quick Style labeled “Heading 2” is designed to look subordinate to the Quick Style labeled “Heading 1”. “Quick Styles” can not only be applied to paragraphs, but can also be applied to individual words and characters in the document. For example, you can emphasize a phrase by applying the Quick Style “Emphasis”. When you format text as part of a list, each item in the list is automatically formatted with the Quick Style “List Paragraph”. If you later decide to change the style for any heading, you can do it by changing the pre-defined characteristics of “Heading 1” and “Heading 2” styles, and Word takes care to automatically update the styles throughout the Word document. Alternatively, you can apply a different Quick Style set or a different theme to change the look of the headings in the word document, without making any changes to the characteristics of existing styles. The built-in styles (Heading 1, Heading 2, etc.) 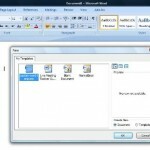 not only ease the formatting of a word document but also makes it easy to generate the table of contents automatically. Built-in heading styles are also used to generate the “Document Map”, which make it easy to quickly jump to the relevant sections in the document. To enable a “Document Map”, select the navigate to “View” tab on the ribbon and select the check box labeled “Document Map” from within “Show/Hide” group. Styles for Characters and paragraphs. You may use the readily available collection of Word Templates and styles in Word 2007 to improve your productivity. You can also find out more about Word Macros and how to create a Word Macro using VBA. Word Table – How To Create Tables In word 2007? 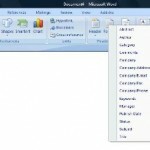 Word Macros: How to Create a Microsoft word Macro? Word Template: How to Create word templates?